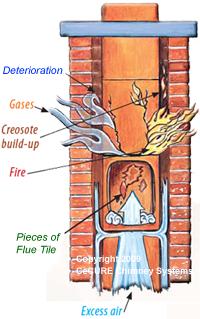 The 1st step in the flue liner repair process for any type Fireplace or Chimney is to have the system objectively and professionally examined so the homeowner is educated as to the options that exist (there are always options) before spending any of your money on a redundant or needless repair. For any major chimney flue liner repair quote always get a second opinion. The only companies that push stainless steel flue liners as the solution for every chimney defect are those who are selling stainless steel. A few Homeowners have somehow lulled themselves into falsely believing that if someone claims they are “certified” they must be competent and honest. Some of the most notorious chimney scammers around the country have advertised as being “certified”. Look at the actual list of credentials each company possesses beyond “certification”. Don’t be distracted by fluff marketing. We think that every chimney professional should have an itemized list of their actual credentials right on their web site. Clay tile Flue liners are no different from any other part of a house in that whey wear down from normal wear and tear over a period of time. This wear and tear manifests its self as pitting, chipping or spalling flue surfaces. Normal wear and tear also results in washed out mortar joints and fizzers and cracks in the flue tiles. The repair of this type deterioration is considered routine maintenance. Your existing flue liner does not need to me demolished and replaced with a metal liner unless it is structurally unsound. 98% to 99% of the recreational chimney systems that we inspect (even those that have had legitimate chimney fires) can be repaired without demolishing and replacing the entire existing flue. Repair can very often be done at less expense then replacement with what may be an inferior material. HeatShield® is a system designed to repair clay flue liners with a resurfacing method that, once completed, The Cerfractory sealant restores the integrity and condition of the flue liner to its original peak level of safety and efficiency. It was designed because the chimney flue liner is one of the most important parts of the chimney system. When there are tears or gaps in the liner, CO2 and other dangerous gasses are allowed to escape and can potentially leach into the home. These gaps can appear because of deteriorated mortar between the flue tiles, stress cracks in the tile itself or spalled clay liners from moisture that has entered the chimney system. Damaged chimney liner? HeatShield® can restore your chimney’s clay flue liner and save you the expense of rebuilding or relining with a stainless steel chimney liner. HeatShield® is a chimney liner repair system that eliminates the hazards and draft problems caused by gaps, cracks and spalling in otherwise sound masonry chimneys. A thorough inspection of your chimney liner may reveal hidden dangers. To choose an effective, economical solution you should know how your chimney works, and understand the fire & health risks these dangers can cause. Are There Hidden Dangers in Your Chimney? These defects no matter how small, can begin a process that will further erode your chimney and can pose a threat to your family’s health. HeatShield® restores the integrity of your chimney’s flue to vent hazardous flue gases from your home. These photos show actual before and after photos of chimneys restored with HeatShield. HeatShield’s® Cerfractory® technology has been proven to withstand moisture, corrosive flue gases and temperatures over 2900°F. London Aire Services has inspected well over 10,000 Fireplace and Chimney systems over the last 20 years. We save our clients thousands and even tens of thousands of dollars on a routine basis. You want to make sure that your dryer duct stays clean because it will help decreases drying time and prevents fires. We specialize in duct cleaning and our service is guaranteed.